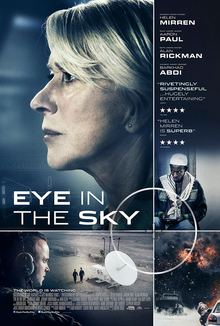 Eye in the Sky is a 2015 British thriller film starring Helen Mirren, Aaron Paul, Alan Rickman, and Barkhad Abdi. Directed by Gavin Hood and based on a screenplay by Guy Hibbert, the film explores the ethical challenges of drone warfare. Filming began in South Africa in September 2014. There was a 2009 article of the same title written by Major Timothy Allen Johnson Sr about USAF ISR Operations in the Middle East. The film premiered at the 2015 Toronto International Film Festival on 11 September 2015. Bleecker Street distributed the film in cinemas in the United States with a limited release on 11 March 2016 and then a wide release on 1 April. It is the last live action film to feature Alan Rickman, who died in January 2016. The film was dedicated to his memory. British Army Colonel Katherine Powell wakes up early in the morning and hears that an undercover British/Kenyan agent has been murdered by the Al-Shabaab group. From Northwood Headquarters she takes command of a mission to capture three of the ten highest-level Al-Shabaab leaders, who are meeting in a safehouse in Nairobi. These include a British couple, Susan Helen Danford (based on Samantha Lewthwaite) and her husband. A multinational team works on the capture mission, linked together by video and voice systems. Aerial surveillance is provided by a USAF MQ-9 Reaper drone controlled from Creech Air Force Base in Nevada by USAF pilot, 2d Lt Steve Watts. Undercover Kenyan field agents, including Jama Farah, use short-range ornithopter and insectothopter cameras to link in ground intelligence. Kenyan special forces are positioned nearby to make the arrest. Facial recognition to identify human targets is done at Joint Intelligence Center Pacific at Pearl Harbor in Hawaii. The mission is supervised in the United Kingdom by a COBRA meeting that includes British Lieutenant General Frank Benson, two full government ministers and a ministerial under-secretary. Farah discovers that the three high-level targets are now arming two suicide bombers (one is American) for what is presumed to be an attack on a civilian target. Powell decides that the imminent bombing changes the mission objective from "capture" to "kill". She informs drone pilot Watts to prepare a precision Hellfire missile attack on the building, and solicits the opinion of her British Army legal counsel. To her frustration, her counsel advises her to seek approval from superiors. Benson asks permission from the COBRA members. Citing conflicting legal and political views and contrasting the tactical value of the assassination with the negative publicity of killing civilians and the status of some of the targets as American or British nationals, they fail to reach a decision and refer the question up to the UK Foreign Secretary, presently on a trade mission to Singapore. He does not offer a definite answer and defers to the US Secretary of State, presently on a cultural exchange in Beijing, who immediately declares the American suicide bomber an enemy of the state. The Foreign Secretary then insists that COBRA take due diligence to minimise collateral damage. Alia, who lives next door, is now near the target building selling her mother's bread. The senior military personnel argue the risk of letting three high-level terrorist leaders, and two real-time suicide bombers, leave the house. The lawyers and politicians involved in the chain of command argue the personal, political and legal merits of and justification for launching a Hellfire missile attack in a friendly country not at war with the US or UK, with the significant risk of collateral damage. Watts and his enlisted sensor operator, A1C Carrie Gershon, can see the more direct risk of little Alia selling bread outside the targeted building, and they seek to delay firing the missile until she moves. Farah is directed to try and buy all of Alia's bread so she will leave, but after paying her his cover is blown and he is forced to flee. Alia retrieves the bread he dropped and sits down to sell it a second time. Seeking authorisation to execute the strike, Powell orders her risk-assessment officer to find parameters that will let him quote a lower 45% risk of civilian deaths. He re-evaluates the strike point and assesses the probability of Alia's death at 45–65%. She makes him confirm only the lower figure, and then reports this up the chain of command. The strike is authorised, and Watts fires a missile. The building is destroyed, with Alia injured but unconscious. However, Danford also survived. Watts is ordered to fire a second missile, which strikes the site just as Alia's parents reach her. Her parents suffer some injuries and rush Alia to a hospital, where she dies. In the London situation room, the under-secretary tearfully berates Benson for killing from the safety of his chair. Benson counters that she watched while having coffee and biscuits, whereas he has been on the ground at five suicide bombings and adds: "Never tell a soldier that he does not know the cost of war." The end credits begin rolling back to the beginning of the movie, with Alia shown twirling her hula hoop. "Drones are new but still a weapon of warfare. It doesn't matter if it's a drone or a sniper rifle, the question is : 'Did we kill the right guy?'" —Gavin Hood, speaking on the film's subject matter. Eye in the Sky is directed by Gavin Hood based on a screenplay by Guy Hibbert. The screenplay was a project initially being developed at BBC Films, and FilmNation Entertainment acquired Hibbert's screenplay from BBC in September 2011 for Oliver Hirschbiegel to direct. Production did not happen as anticipated, and Hood sent the screenplay to Xavier Marchand, president of Entertainment One. Marchand decided to develop it to produce a film with Hood directing. Entertainment One partnered with Raindog Films in April 2014 to produce Eye in the Sky with Colin Firth as one of the producers. Actors Helen Mirren and Aaron Paul joined the cast the following month. Hood, who was born in South Africa, chose to film Eye in the Sky in his home country. Filming began in South Africa in September 2014. Since the South African Civil Aviation Authority did not grant filmmakers permission to fly real drones in the country's airspace for the production, they used visual effects to display the drones. Hood found practical locations throughout South Africa that substituted for settings in the film: an area that looked like Surrey for Mirren's character, clubs that looked located in Las Vegas, and Beaufort West which was a backdrop for the state of Nevada in the United States. Filming concluded on 4 November 2014. None of the four lead actors—Mirren, Rickman, Paul, and Abdi—met one another during production, instead filming alone with Hood due to their characters' separate locations in the film. For example, despite the two costarring in a pair of films (Eye in the Sky and the animated feature Help! I'm a Fish), Aaron Paul and Alan Rickman had never met each other in person, according to Paul himself in an interview with The Guardian. Mark Kilian and Paul Hepker, who scored Hood's films Tsotsi (2005) and Rendition (2007), reteamed to score Eye in the Sky as did editor Megan Gill. Eye in the Sky premiered at the 2015 Toronto International Film Festival on 11 September 2015. The film had its United States premiere on 7 January 2016 at the Palm Springs International Film Festival. Bleecker Street distributed the film in the United States, releasing it in New York City and Los Angeles on 11 March 2016 and gradually expanding to additional markets on the following two weekends. On 1 April 2016, the film received a wide release. Deadline said this release was positioned to take place after the 2015–2016 awards season. Entertainment One distributed the film in the United Kingdom on 8 April 2016 and Malta in May 2016. It will also distribute the film in Canada, Belgium, the Netherlands, Luxembourg, Spain, Australia, and New Zealand. Eye in the Sky grossed $6.6 million in the UK, $18.7 million in North America and $32.8 million worldwide. The film grossed $113,803 in the United States on its opening weekend of 11–13 March 2016 from five screens, an average of $22,761 per screen. In its wide release the film grossed $4 million, finishing ninth at the box office. Eye in the Sky received positive reviews. On Rotten Tomatoes, the film has a rating of 95%, based on 175 critics, with a weighted average score of 7.5/10. The site's consensus reads, "As taut as it is timely, Eye in the Sky offers a powerfully acted – and unusually cerebral – spin on the modern wartime political thriller." On Metacritic, the film has a normalised score of 73 out of 100, based on 38 critics, indicating "generally favorable reviews". Rickman's performance was well received by critics, with Richard Roeper of the Chicago Sun-Times saying, "Mr Rickman was never nominated for an Academy Award and it's probably a long shot for a posthumous Supporting Actor for this film - but his work here is a reminder of what a special talent he possessed." Peter Asaro on Science & Film reviewed the accuracy of the advanced military technology depicted in the film concluding, "keep in mind that while some of the advanced technologies depicted are not yet out in the field, many are only a few years away from being a reality." ^ "Eye in the Sky (15)". British Board of Film Classification. 1 February 2016. Retrieved 1 February 2016. ^ a b "Eye in the Sky (2016)". The Numbers. Nash Information Services, LLC. Retrieved 20 January 2017. ^ a b Staff (9 December 2015). "Eye in the Sky: watch the UK trailer for the drone warfare drama starring Helen Mirren and Alan Rickman – video". The Guardian. Retrieved 9 December 2015. ^ "ISR operations: 'Eye in the sky'". U.S. Air Force. Retrieved 27 December 2018. ^ Roberts, Sheila (10 March 2016). "Helen Mirren & Gavin Hood on 'Eye in the Sky' and Working With Alan Rickman". Collider. Retrieved 3 May 2016. ^ a b White, James (22 October 2014). "Exclusive First Look At Helen Mirren In Eye In The Sky". Empire. Retrieved 23 October 2014. ^ a b c Reilly, Travis (28 October 2014). "'Breaking Bad' Star Aaron Paul Is a Conflicted Drone Pilot in 'Eye in the Sky'". TheWrap. Retrieved 29 October 2014. ^ a b c d e Grierson, Tim (11 September 2015). "'Eye In The Sky': Review". Screen International. Retrieved 11 September 2015. ^ Thangevelo, Debashine (2 February 2015). "SA's Beukes to raise hell in Hollywood". Independent Online. Retrieved 2 February 2015. ^ Thangevelo, Debashine (2 February 2015). "Kim's kick-a** roles in US productions". Independent Online. Retrieved 2 February 2015. ^ Trenholm, Richard (23 August 2016). "Life in the kill box: 'Eye in the Sky' targets the ethics of drone strikes". CNET. Retrieved 23 August 2016. ^ McNary, Dave (12 September 2011). "FilmNation flies high with 'Sky'". Variety. Retrieved 10 September 2014. ^ a b McClintock, Pamela; Anderson, Ariston (5 September 2014). "Toronto: First Controversial Drone Movie Strikes, Questions U.S. Policy". The Hollywood Reporter. Retrieved 10 September 2014. ^ Barraclough, Leo (30 April 2014). "Cannes: eOne Partners with Colin Firth, Ged Doherty on 'Eye in the Sky'". Variety. Retrieved 10 September 2014. ^ a b Sneider, Jeff (16 May 2014). "Aaron Paul, Helen Mirren Join Colin Firth in Thriller 'Eye in the Sky'". The Wrap. Retrieved 10 September 2014. ^ Staff (16 January 2015). "Hood tackles Eye in the Sky By". Screen Africa. Retrieved 29 January 2015. ^ Staff (4 June 2014). "Drag on drone movie". The Times. Retrieved 3 October 2014. ^ Cornelius, Jerome (5 November 2014). "Gavin Hood ready to go to war". The Times. Retrieved 5 November 2014. ^ a b D'Alessandro, Anthony (7 October 2015). "Aaron Paul-Helen Mirren Drone Thriller 'Eye In The Sky' Spies March 2016 Release Date". Deadline Hollywood. Retrieved 15 November 2015. ^ Anthony, Andrew (10 April 2016). "Aaron Paul: 'It's impossible not to throw our own emotions into the mix'". The Guardian. Retrieved 31 August 2016. ^ Staff (29 January 2015). "Mark Kilian & Paul Hepker to Score Gavin Hood's 'Eye in the Sky'". Film Music Reporter. Retrieved 28 July 2015. ^ Punter, Jennie (28 July 2015). "Toronto Fest to Open With Jake Gyllenhaal's 'Demolition'; 'Danish Girl,' 'Martian' in Lineup". Variety. Retrieved 28 July 2015. "Eye in the Sky". TIFF.net. Toronto International Film Festival. Archived from the original on 17 August 2016. Retrieved 28 July 2015. "The Schedule". TIFF.net. Toronto International Film Festival. Retrieved 9 September 2015. ^ Fessier, Bruce (18 December 2015). "Complete Palm Springs film festival lineup announced". The Desert Sun. Retrieved 18 December 2015. "Eye in the Sky". psfilmfest.org. Palm Springs International Film Festival. Retrieved 18 December 2015. ^ Setoodeh, Ramin; Lang, Brent (14 September 2015). "Toronto: Bleecker Street Acquires 'Eye in the Sky' Starring Helen Mirren". Variety. Retrieved 14 September 2015. ^ Fleming, Mike (14 September 2015). "'Eye In The Sky' Deal Done, With Bleecker Street Inching Over Fox Searchlight & Roadside – Toronto". Deadline Hollywood. Retrieved 14 September 2015. ^ "Foreign total gross". Box Office Mojo. IMDb. Retrieved 3 September 2016. ^ "Eye in the Sky (2016)". Rotten Tomatoes. Fandango. Retrieved 3 September 2016. ^ "Eye in the Sky Reviews". Metacritic. CBS Interactive. Retrieved 7 April 2016. ^ "Eye in the Sky': Helen Mirren, co-stars excel in tense war drama". Chicago Sun-Times. 13 April 2016. ^ Asaro, Peter (19 April 2016). "Dr. Peter Asaro on Drone Technology in Eye in the Sky". Sloan Science & Film. Retrieved 21 December 2016. This page was last edited on 5 March 2019, at 09:07 (UTC).